MEI Mail & Document Management Services needs to meet growing volume demands. To increase productivity and efficiency by replacing their existing scanners with scanners from Alaris. Two high-speed Kodak i5850 Scanners. Significant increases in volume and efficiency, greater staff enthusiasm due to ease of use, and plans to add more units to enable further growth. Headquartered in Dallas, Texas, with multiple locations across the country, MEI began operations in 1993 as a mail room outsourcing firm and has since expanded into document imaging and document management. Determined to be leading edge in its industry, MEI has leveraged technology and innovation to provide optimal scanning solutions for its customers. 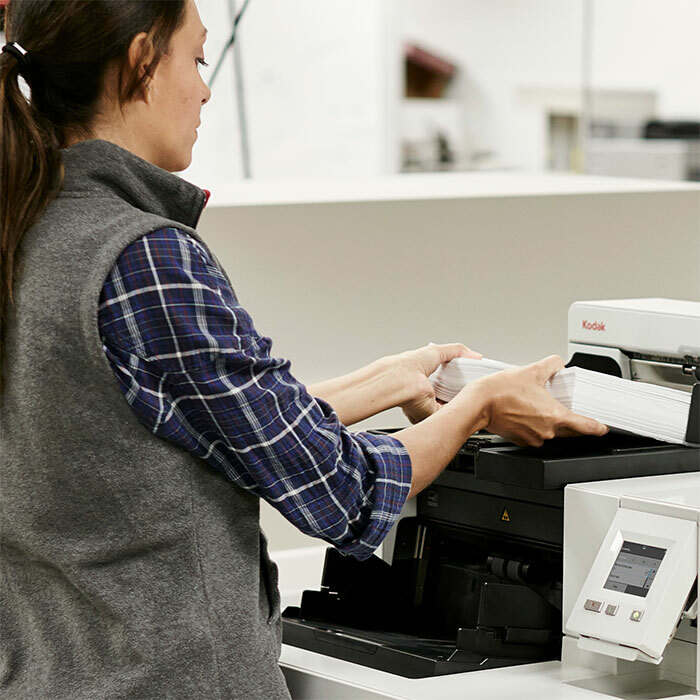 In the Fall of 2017, as part of its strategic plan for growth, MEI needed to increase their document imaging and content management capabilities. That also meant a need to scan more information— while looking at how to control and cut costs, reduce prep time and improve quality control. Leslie Marshall has been at the helm of MEI since the beginning. In his time as CEO, he’s seen his business evolve and wants to make sure his company stays ahead of the curve — increasing volumes and maintaining quality control for customers, all while cutting internal costs. Leslie found himself asking the same question over and over again, “How can we get the most documents through our system in the shortest amount of time, while maintaining the high level of quality clients have come to expect with the latest technology?” The answer became clear as soon as the i5850 Scanner arrived. MEI can now scan 8 boxes of documents per day for the Army Corps of Engineers, one of MEI’s largest clients, containing anywhere from three to five thousand documents per box. In addition, MEI has been able to work through the Army Corps’ backlog of paper files, enabling all of their legacy files to be accessed digitally. MEI has similarly used the i5850 Scanner to support another large customer, the Veterans Administration’s Michael E. DeBakey Medical Center in Houston, Texas. MEI has had a wonderful experience with the Alaris repair and maintenance services team. With its multi-industry range of customers, MEI sometimes needs to scan very old documents, which can leave a dust build-up on the scanner. Alaris service technicians showed the MEI team how to clean the dusty cameras using special cloths and air compressors to reduce the accumulation of dust and keep the i5850 running smoothly. Technicians were also able to show the MEI Imaging Specialists how to get the most out of Alaris Perfect Page Technology, which automatically improves the image quality of scanned documents. “The support from Alaris is outstanding,” says Angela Freeman, MEI’s Director of Sales and Operations. Thanks to the i5850 Scanner’s ease of use combined with Perfect Page Technology, the image quality of scanned files is significantly improved. Perfect Page also shifts gears automatically to handle a wide range of documents, so there’s virtually no presorting, minimal rescanning and image quality can actually be better than the original. Thanks to all the productivity gains resulting from the i5850 Scanners, fewer imaging specialists are needed to scan higher volumes of documents, resulting in a significant decrease in labor costs. According to internal figures, when factoring in initial investment costs, annual hardware costs, maintenance, and labor costs, the i5850 is 66% less expensive to operate than MEI’s previous solution. Overall, Leslie and the MEI staff are entirely satisfied with their investment in the i5850 Scanners from Alaris and they plan to add more as part of their growth strategy moving forward. Want to see more success stories like these? Visit the Case Studies page on our Insights section to keep reading.